In addition to his books, Dr. Upledger developed study guides for classroom instruction and wrote dozens of articles for peer-reviewed and special interest publications. Alternative Medicine Program Advisory Council for the Office of Alternative Medicine at the National Institutes of Health in Washington, D.C.
Dr. John E. Upledger is co-founder of The Upledger Institute International, Inc. and former medical director of Upledger Clinical Services. Born on February 10, 1932 in Detroit, Michigan, Dr. Upledger passed away on October 26, 2012 at his home in Palm Beach Gardens, Florida. For manual therapists and other healthcare practitioners worldwide, his legacy is his generosity of spirit in sharing his discoveries and knowledge and ensuring their right to practice, For his patients and the patients of his students, his legacy is an open mind and heart to the validity of non-traditional medical approaches. For his family and good friends everywhere, his legacy is to stay with your journey despite the obstacles. He has proudly passed the torch From His Hands to Ours. Before he passed away in 2017, Dr. Upledger's son and Upledger Institute International CEO, John Matthew Upledger recorded a series of Fireside Chat videos to share some of his perspective of father's ideas and stories. We hope you enjoy. Fireside Chats with John Matthew Upledger: "CranioSacral Therapy and Autism"
Dedicated to the natural enhancement of health, the Institute is recognized worldwide for its groundbreaking continuing-education programs, clinical research and therapeutic services. Throughout his career as an osteopathic physician, Dr. Upledger was recognized as an innovator and leading proponent in the investigation of new therapies. His development of CranioSacral Therapy in particular has earned him international acclaim. Although much of his experience was garnered through private clinical practice, Dr. Upledger served from 1975-1983 as a clinical researcher and Professor of Biomechanics at the College of Osteopathic Medicine at Michigan State University. It was during those years that his team of anatomists, physiologists, biophysicists and bioengineers were tasked with performing the experiments testing the existence and influence of the craniosacral system. The results of those scientific studies explained the function of the craniosacral system and its use in evaluating and treating poorly understood malfunctions of the brain and spinal cord. Dr. Upledger went on to develop CranioSacral Therapy and other complementary modalities that are now taught worldwide to healthcare professionals through Upledger Institute International's educational programs. Over 100,000 practitioners trained in more than 100 countries have taken Upledger courses. 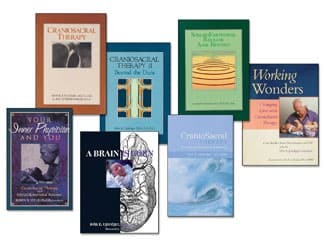 Shop for more CranioSacral Therapy related products.